The title of this posting probably sounds like a silly joke, but Moss is famous in Norway for "Mosselukta" (the Moss smell). As soon as I stepped off the train I could not only smell it, but also see the factory chimney from which it issued. The cellulose factory of Borregaard is located in the centre of Moss, and spews out sulphurous fumes that smell faintly like rotten eggs. It used to really stink up the whole town, but in the last decade or so it has gotten better. 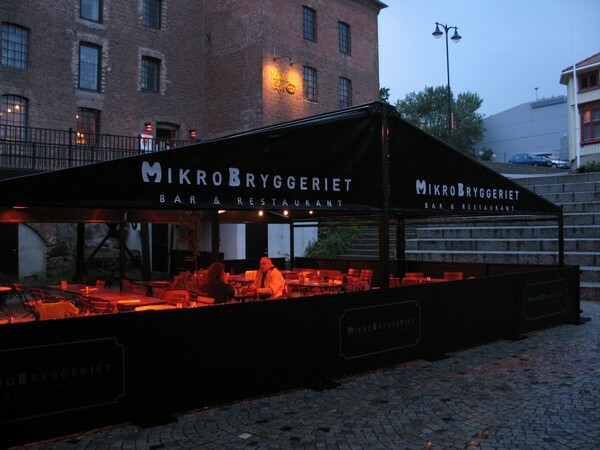 Still, not the best conditions for trying a microbrewery with outdoor serving, but having spent 40 minutes (and 200 kroner) on the train, I gave it a try anyway. Møllebyen Mikrobryggeri is located in a formerly industrial site whose old brick buildings have been redecorated, and now house cafés, design shops, and so on. In fact, the Møllebyen area is probably the best-looking part of Moss. Despite having grown up in the province of Østfold, I have little love for the towns of Østfold; they are all tiny little places ruined by industrialization and modernization. Fredrikstad might be the only real exception (and possibly Mysen, if you consider that a town). In other words, if you want to visit the microbrewery, using the idyllic beauty of Moss to persuade people to join you will not work. At best it will only work until you have arrived. If you really need an excuse to go here, Jeløya and Son (the old spelling, funnily enough, is Soon, still seen in places) are probably your best bets, but they require a car, or at least a bicycle if you want to also visit the microbrewery. (Møllebyen Steamer.) Smallish offwhite creamy head with some larger bubbles. Light brown body. Delicate flowery hop aroma well balanced with a touch of metal and very faintly roasted malt background. Taste is a harmonious blend of burnt caramel malts and flowery hops. Light, bitter aftertaste. Slight graininess in the mouthfeel. A good session beer. It's a bit watery, but the harmonic spiciness/hoppiness more than makes up for this. Definitely grew on me as I drank. I suspect they feel forced to brew light (if not necessarily bland) beers in order to actually sell them to a public that is unused to beers that really taste of something. With time they may feel emboldened to try something more adventurous. At least I hope so.